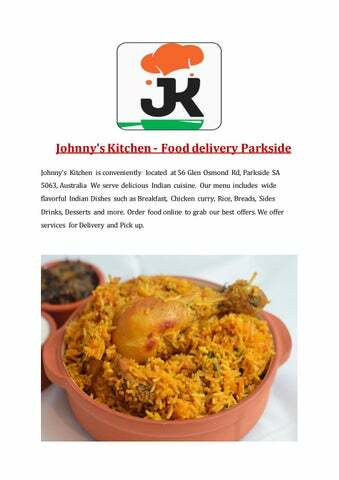 Johnny's Kitchen - Food delivery Parkside Johnny's Kitchen is conveniently located at 56 Glen Osmond Rd, Parkside SA 5063, Australia We serve delicious Indian cuisine. Our menu includes wide flavorful Indian Dishes such as Breakfast, Chicken curry, Rice, Breads, Sides Drinks, Desserts and more. Order food online to grab our best offers. We offer services for Delivery and Pick up.